One of the neat things about writing a business success book is that in the process, you get clearer about the concepts and ideas that shape your business and what you are writing about. 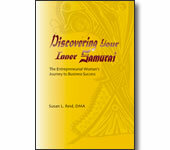 In the case of my book, Discovering Your Inner Samurai: The Entrepreneurial Woman's Journey to Business Success, my concept of Inner Samurai really took shape and form. This book is about discovering your Inner Samurai. That part of you that is the repository of all your life experiences and all your hopes and dreams. Alchemized over the years from lead into pure gold, your Inner Samurai is your greatest source of strength and knowing. It is the seat of your wisdom. It is also the place of your extraordinary uniqueness. As the way of all things, about the time I was becoming clearer in expressing the Inner Samurai concept , my client Dana Weekley of her newest business NineTomatoes, sent me this drawing she was working on. I loved it so much I asked if I could use it for my new Inner Samurai moniker. Dana graciously agreed. Thank you Dana!!!! Today, I am officially unveiling her. Don't you just love her? 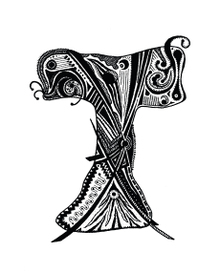 Here is my old moniker. So, what do you think of my new Inner Samurai look? I love that as you got clearer about your business, you helped shape mine as well! Co-creating with you, Susan, is a pleasure. Here's to your success! Cheers and thank you. The minute I saw your drawing, I knew. I knew that your marvelous drawing was the outward expression of the vision I hold for all women and their Inner Samurai. I so appreciate your talent and your inner creation, Dana.Thank you. Carol, I will be sure to pass along your comments to Dana. You're right, her artwork represents the Inner Samurai, successful entrepreneurs, and strong women everywhere. So, too, me. Thanks for stopping by! Thank you, Carol, for your kind comments. Susan was instrumental in leading me to the place where that "T" was born. Then she just willed it into existence!